I was born and raised in Langley, BC where my early years were spent engaging in a wide variety of sports. My passion for Football landed me a scholarship to Simon Fraser University where I earned a Bachelor of Science degree in Kinesiology. Following University, I went onto pursue my Doctor of Naturopathic Medicine from the Boucher Institute in New Westminster. I was first introduced to Naturopathic Medicine through my own health challenges. Many hard years on the field and in the gym left me with a whole host of left over injuries. I struggled with chronic pain for a long time and slowly began to accept the fact I would be stuck suffering for years to come. Then, everything I knew about medicine was blown wide open when I reversed all my injuries within two years using Naturopathic Medicine. As soon as I realized people didn't have to live in pain my vision became clear. I set out on my journey to learn as much as I could about these valuable treatment techniques and spread the word about the options available to people in need. I am committed to helping you reach your health goals the same way my doctor helped me. In addition to my Bachelor of Science and Naturopathic Physician designations I am also a Certified Strength and Conditioning Specialist and an active member of the National Strength and Conditioning Association. I have extensive work experience with sports specific training, musculoskeletal injuries and rehabilitation protocols. For the past several years I have worked alongside Chiropractors, Massage Therapists, and Naturopathic Doctors completing several internships centered on helping patients with weight loss, pain management and nutritional programming. After my first year of medical school, I completed a 10-day intensive in Nicaragua working at a local clinic that services the residents on the Island of Ometepe. 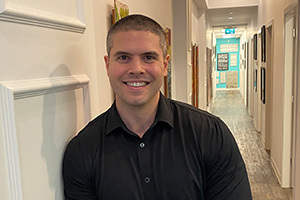 I am also a part time faculty member at the Boucher Institute of Naturopathic Medicine where I teach Exercise Therapeutics and assist with the Physical Medicine and Spinal Manipulation classes. I have undergone continuing education training in Prolotherapy, Applied Kinesiology, Total Body Modification (TBM) and Emotional Freedom Technique (EFT). In my spare time I enjoy playing guitar, riding BMX and exploring the outdoors. I am currently accepting new patients and look forward to working with you.